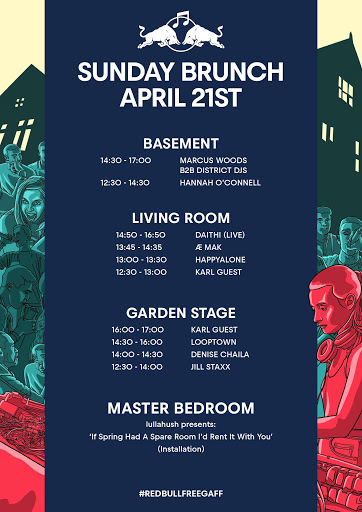 Red Bull’s Free Gaff has announced the lineup for their Sunday Brunch event, which includes acts like Daithi, AE MAK, Denise Chalia and more, well as an art installation by indie artist lullahush. The event will take place from 12:30 to 5 pm on 21 April. A limited number of tickets for the Sunday Brunch are available from €20 excluding booking fees at www.redbull.ie/freegaff. The Red Bull Free Gaff will run from April 19-21 for three nights of partying, pizza and performances at an unknown Ballsbridge home. Featuring hip-hop and electronic artists like Krystal Klear, Le Boom, Boots & Kats, Quinton Campbell, Kean Kavanagh, Jill Staxx, jyellowl and Why-Axis on three separate floors of music, this second annual gaff is sure to be an unforgettable experience. Though tickets for the night parties have already sold out, the Sunday Brunch offers hopefuls one last chance to partake in the festivities. lullahush, also known as Red Bull Music Academy alumni and producer of AE MAK Daniel McIntyre, will contribute an art installation to the new event. The installation will bring to life the music video for lullahush’s latest single, ‘If Spring Had a Spare Room I’d Rent It With You.’ The playful video, which involves a couple constructing a bed on a beach, will be translated into a physical bedroom at the gaff. Attendees will be able to lie on the bed and change their own surroundings with the help of a controller.